← What is that Shadowy Thing? Solved. To build an English-style tool chest, you don’t need a chest full of hand tools. Here is what I consider the minimum tool kit necessary to build this chest during a class or in your shop (as soon as you have your stock dimensioned). Depending on how you cut your dovetails, you can skip some of the equipment. If you cut pins first, you can get away without a marking knife. If you like your dovetails a little irregular looking, you can dispense with the dovetail marking gauge and the dividers. If you truly cut your dovetails “by hand” then you don’t need a dovetail saw (you ninja). This entry was posted in The Anarchist's Tool Chest, Woodworking Classes. Bookmark the permalink. Could you reduce your saws by 33% by only having a carcass saw and coping saw? (of course you could get by with only the coping saw, but let’s not get crazy) Or is there someplace you’ll need the extra depth of the tenon or fineness of the dovetail? I took your advice (one of my all time favorites from a long time ago http://www.popularwoodworking.com/woodworking-blogs/chris-schwarz-blog/woodworking-in-america-the-saws-you-need) and started with a carcass saw and haven’t yet seen the need for a dovetail saw. This is a great list btw, not trying to nitpick. The tenons on the lid are 4″ long. So you need either a tenon saw or a panel saw that can make that deep cut. I find that a rip filing tracks better when cutting dovetails. So I prefer a dovetail saw. If your carcase is filed rip, then you have achieved the same end result. I do in fact have both filings of carcass saw, and a larger tenon saw, but thanks for the clarification. If I had a Lund saw, I would certainly use it when I had the opportunity. 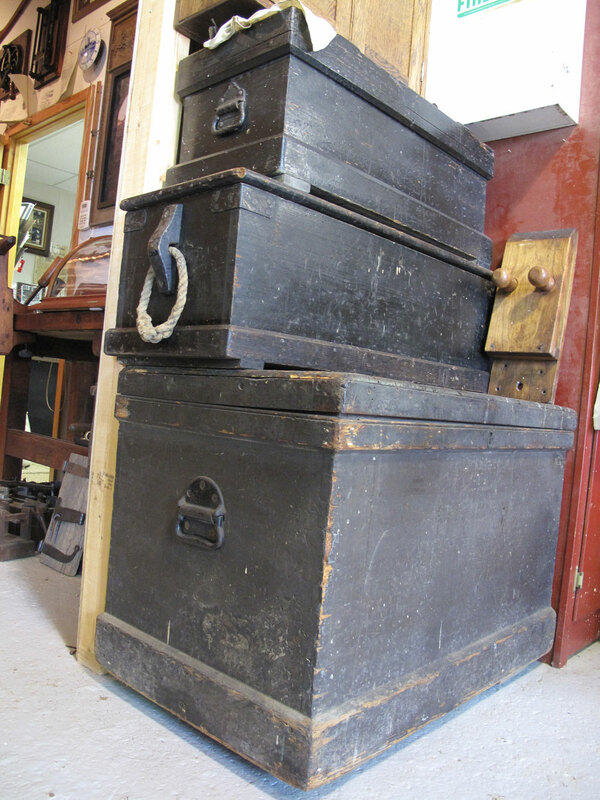 Would the list change significantly for a French style tool chest? How is a French chest different? I don’t know if I’ve seen a French tool chest, though they must exist. I just priced this list. All new. Planes and saws from LV, (no beading plane) other stuff as cheap as possible, but still new. About $1275, I’d spend a bit more, but not too bad, really. I just did the same think with Woodcraft – you could get all the planes (except plow), saws, chisels, and marking tools for right around $850 – I think this is a great argument for starting with hand tools – but Chris didn’t include any panel saws, and you have to go antique unless you are using a power drill. I have the Woodriver jack and block planes. I like them a lot. They were the first hand tools I bought, and I went in knowing nothing. They have served me well. Lee Valley’s brace is actually more affordable than the one on Woodcraft. I have a brace, but honestly I just use a power drill. It was the one tool I had going into woodworking. The only things I don’t like it for are delicate woods and times where I need a precise depth. A little shopping at swap meets, craigslist, ebay and hyperkitten and I’d bet you could come in under $500 for a decent kit of tools. Even with a screwdriver. No doubt, true, but that approach could take months, IMO. Not including time it would take to get some used tools into working condition assuming I knew how (or had the desire) to do that. I got most of my stuff new. I feel like now that I have experience, I could try vintage and used stuff, but I definitely am glad I got new tools to get me going right away. FWIW, I got most of my hand tools used. There is plenty of info out there on setting up planes and general sharpening and it wasn’t too hard to make the tools sharp enough to do my first project (a roubo style bench out of reclaimed doug fir timbers). I started with almost all used tools (mostly ebay buys). I have three or four stinkers that cost me maybe $50 bucks total. Besides that, I didn’t find it very intimidating to go that route. Not even that much time. Personally, I just sharpen all my tools on my rock hard abs. This is basically the kit I started with, based on your book. The one thing I got that’s not on the list was a router plane. I don’t cut a ton of grooves, but I’m finding the router plane with attached fence can serve basically the same function as the plow plane, albeit slower. I’ve been debating whether the projects I make even require a plow plane. I have one, but it just doesn’t get much use. Are there good uses for it besides box and drawer bottoms? You can use the plow (a woodie or an iron combo) for making rabbets. Instead of cutting the entire rabbet with the narrow plow iron, cut what will become the inside corner. Then come back with a chisel or bench plane to bring down the remainder. If you have one of the larger iron combo planes, they have rabbeting blades and the fence can be passed under the blade making it function like a moving fillister. Knife and or saw the edge for minimum tearout. Extra steps but a way to keep the kit size at a minimum. And with some creative battening and fencing and good knife lines, you can make dados with a plow. Probably easier to knife, saw and chisel them though. Oh, and if you have narrow blades, like 1/8″, you can use the plow to help you saw straight on long rips. Like you would need to remove a moulding from the edge of a wider piece of stock. Or use it like a slitting plane and work both sides of the board to meet in the middle, freeing up the moulding. Or learn to saw straight. I have the Veritas small plow plane. I haven’t used it much for rabbets, though I cut more of those than I do grooves. It’s one of these debates where I have it, so I should probably hold onto it, but I wish I had more use for it. I’ll say this, I love using it when I get the chance. Always fun. Sometimes I just cut grooves in scrap. Makse me wish I’d have been born rich instead of so good looking. I was hoping it was along the lines of the kits Lie-Nielson has on their site like “The Works Joinery Set’ (speaking of being born rich). Being Canadian, Lee Valley is a little more accessible to me. Is that a leather stitching vise sitting on the bottom chest? I can not stress enough you don’t need a plow plane. Granted they are nice but if you live somewhere were there is no access to one or do not have the funds a marking gauge and a chisel held in the shallow will do. I and if funds are really tight you don’t need the combination square; you could also get away with going to Home Depot and picking up what they call a “professional” hand miter saw built by Buck Brothers and use it as a tenon saw (due to the number of tpi) and also use it for dovetailing. So two birds killed with one stone. You could also get away without a mortise chisel. All of these things I have done to build the chest and yes I still think you could potentially get by with less. As to the plow plane thing, yeah, you could do the operation with a cutting gauge, a utility knife and a chisel. I’ve done it. And after doing it once, I swore I wouldn’t cut another groove like that until I got a plow plane. And I kept my promise.